It is at first surprising to many people that the wearing of helmets by cyclists is a controversial subject. However, cycling safety is a much more complex issue than many people realise, where best evidence and real-world experience sometimes conflict with received opinion. Key considerations about risk when cycling, what influences cycling safety and the inter-relationships between safety interventions, cycle use, behaviour and health (both individual and public) are often poorly understood. In particular, opinions as to whether cycle helmets are an appropriate, proportionate or effective intervention are often dominated by emotion and expressed with exaggeration, which can make it difficult to know what to believe. This overview is an attempt to distill the most important evidence and arguments about cycle helmets. Readers are invited to explore the cyclehelmets.org website for comprehensive information on the topics covered with in-depth technical analysis and references. Cycle helmets have been around since 1975. They were originally a 'spin-off' product from the development of expanded polystyrene foams in motorcycle helmets, intended to supersede the old 'hair net' style of head gear then used in cycle sport. However, the protection offered by cycle helmets is very much less than that provided by motorcycle helmets due to the compromises in weight and ventilation necessary in order to make them acceptable for an activity such as cycling that involves much physical exertion. Indeed, because of changes to design in order to address concerns about comfort, modern helmets with soft shells are considered to offer less protection than some earlier designs with hard shells. At first cycle helmets were promoted mainly by their manufacturers, with competing claims about their effectiveness. Then, during the 1980s, reports began to be published suggesting that if cyclists wore helmets they would be less likely to suffer head injury. From that time, the promotion of helmet wearing by cyclists has been a main thrust of road safety and health practitioners in many countries. Cycle helmets protect the head by reducing the rate at which the skull and brain are accelerated or decelerated by an impact. The helmet acts like a shock absorber. As it is impacted, the expanded polystyrene liner is intended to crush, dissipating the energy over a rapidly increasing area like a cone. Helmets reduce the force of an impact only while the polystyrene liner is compressing. Once the liner is fully compacted, a helmet offers no further protection and passes residual energy straight on to the skull and brain. There is no evidence to suggest that helmets continue to provide a reduced level of brain protection beyond their design limits. When helmets fail, they do so catastrophically, rather than gradually, by breaking. The breaking of a helmet is not by itself evidence that it has provided useful protection to the wearer. It is common for cycle helmets to fail prematurely, before the polystyrene liner has been fully crushed. Indeed, very often helmets break without the liner compressing at all, perhaps because they have been subjected to oblique forces, not directed at the head, that they are not designed to withstand. If a helmet breaks without its liner compressing, it is likely that no more than superficial protection would have been afforded. Cycle helmets are specified by their manufacturers as meeting one or more of the international standards for this equipment. All of the standards test the helmet's protection of only a decapitated headform, (i.e. one with no body attached); and all tests involve only low speed impacts. Impact speeds are less than 6.6 m/s (24 km/h or 15 mph), and in some cases, barely 5 m/s (18 km/h or 11 mph). Unlike seatbelt tests, helmet test standards do not realistically replicate serious crashes. The highest standards are those of the nominally independent Snell Foundation, of which the B-95 standard is the most rigorous; however, the Snell standard is rarely used by manufacturers. The European standard EN 1078 is particularly weak and some other standards have declined over time. This is in part a reflection of the involvement in these standards committees of the helmet manufacturers, who want to minimise production costs in a fiercely competitive market. Few helmets are designed to offer protection better than that specified by the standards. There is no mandatory, third-party testing of helmets, and independent surveys have shown that many of the helmets on sale do not meet the standards to which they are accredited. Very few meet the more demanding standards. All standards prescribe tests using a flat anvil (though with greatly differing impact energies) but few include a test involving a hemispherical anvil, which is often closer to real-life crash conditions. No standard specifies tests involving rotational impacts. The Australian/New Zealand standard 2063:2008 is the first to encourage (but not require) the use of softer foam to provide more cushioning for the brain. This appears to be an acknowledgement that the foam in most helmets is too rigid to crush as intended. Injuries to the head may be divided into direct, or focal, injuries and rotational, or diffuse, injuries. Direct injuries occur as a result of linear acceleration of the skull by impact with another object, and typically lead to cuts, lacerations and concussion. Direct injuries, though sometimes painful, usually have minimal long-term effect. Rotational injuries, on the other hand, do not necessarily involve direct contact with the head but result in the brain moving relative to the skull as a result of angular or rotational acceleration, which leads to diffuse axonal injury (DAI) and subdural haematoma (SDH). These are the most common ways that road crashes cause death or chronic intellectual disablement. Cycle helmets may produce benefit by reducing and spreading the forces that lead to direct injuries. However, they are not designed to mitigate rotational injuries, and research has not shown them to be effective in doing so. To the contrary, some researchers have expressed concern that cycle helmets might make some injuries worse by converting direct forces into rotational ones. These injuries will normally form a very small proportion of the injuries suffered by cyclists, but they are likely to form a large proportion of the injuries with serious long-term consequences. In this way cycle helmets may be harmful in a crash, but this harm may not be detected by small-scale research studies. The active promotion of helmet use by cyclists is a fiercely controversial and often emotional subject, with views put forward with great conviction both for helmets and sceptical of their value (very few people argue against the voluntary use of cycle helmets per se). Controversy is particularly acute with regard to mandatory helmet laws. The arguments in favour of helmet use are invariably based upon the premise that in the event of a fall, a helmet might substantially reduce the incidence and severity of head injuries. A relatively small number of medical research papers are cited in support of this premise, most based on case-control studies. One 1989 paper is cited more often than any other, with its claim that helmets reduce head injuries by 85% and brain injuries by 88%. However, the methodology and findings of this paper have been widely criticised and there is no real-world evidence to support its predictions. Proponents of helmet use include people from within the medical and road safety professions and also people who believe that a helmet has already saved them, or a relative or acquaintance, from serious injury. Helmet-sceptic arguments are more varied. Originally based largely on issues associated with personal liberty, the balance of helmet-sceptic arguments changed during the 1990s as the health benefits of cycling became more acknowledged and as independent research started to be undertaken into the outcomes of rising helmet use and, in particular, the effects of cycle helmet laws. The risk of serious head injury is small and frequently overstated. The promotion or mandation of cycle helmets is a disproportionate response to this risk. There is no real-world evidence that helmets have reduced the likelihood or severity of head injuries among whole populations of cyclists. Helmet promotion (and especially compulsion) reduces cycling and the health benefits of cycling. Less cycling increases risk for those who continue to cycle, whether they wear helmets or not. Much pro-helmet research and promotional material is flawed or one-sided. Insofar as there are risks associated with cycling as a form of transport, the greatest risks of serious injury come from inappropriate motor vehicle use and poor cycling behaviour. Institutionalising the idea that wearing a helmet is necessary for safe cycling diverts attention from more important actions to prevent crashes happening in the first place and results in victim-blaming when crashes do occur through no fault of the cyclist. Cyclists should not be singled out for helmets when head injuries to pedestrians and motorists are much more numerous. Helmet sceptics include cycling organisations (especially in Europe where some have undertaken their own research), public health doctors and other professionals concerned with cycling safety, encouraging cycle use and helmet analysis. Most cycle users are also not convinced of the net benefits of helmet wearing as in most places fewer than a third of people choose to wear one when use is voluntary. In recent years many individuals and cycling organisations have swung from pro-helmet to helmet-sceptic as a result of experience with helmet laws and the growing breadth of evidence. Most published medical research that has studied the effectiveness of cycle helmets has been based on case-control studies, where groups of cyclists, with and without helmets, have been compared. This research has led to predictions of very large reductions in head injury through the use of cycle helmets – Table 1 shows the predictions of some of the most frequently cited papers. Three meta-analyses of case-control studies have also found strongly in favour of helmet effectiveness. Although a considerable number of papers have been published in the medical journals expressing support for helmet use, very few could be described as primary research into helmet effectiveness. The majority are either dependent upon the results of earlier research, or are concerned with secondary matters such as the promotion of helmet use. As early as 1988 Rodgers studied 8 million cases of injury or death to cyclists in the USA over 15 years - the largest survey of its kind ever undertaken. He concluded that there was no evidence that hard shell helmets had reduced head injury or fatality rates. Indeed, he found that helmeted riders were more likely to be killed. A decade later, Kunich analysed cyclist and pedestrian fatalities in the USA and concluded that there was no evidence that cycle helmets were effective in reducing deaths. Spaite found that bare-headed cyclists more often had severe injuries. However, this was true even when cyclists without major head injuries were analysed as a group. The implication being that people who do not use helmets tend to be in higher impact collisions than helmet users, since injuries are more severe to all parts of the body. In 2001, the US Consumer Product Safety Commission reported that although helmet use had risen over a decade from 18% to 50% of cyclists, head injuries had also gone up by 10%. There was no clear evidence that cycle use had increased. An analysis of cyclist and pedestrian fatalities in Canada from 1985 to 2003 showed that trends for both modes were similar and the number of deaths fell in both cases. However, although cycle helmet use had grown from virtually zero to 50% over the period, there was no detectable impact on cyclist fatalities compared with pedestrians. In 2009, a wide-ranging international review of the literature for the UK Department for Transport (when both pro-helmet and helmet-sceptic interests had the opportunity to contribute towards the evidence considered) concluded that there was no reliable evidence that cycle helmets have resulted in a lower risk of head injury for cyclists. The UK courts have not to date determined that wearing a helmet would have made any material difference in the cases of serious or fatal injury that they have considered. In these circumstances, a detailed analysis of crash causation and the individual crash circumstances is carried out. So far as can be determined, nowhere in the world has an increase in helmet use resulted in a fall in head or brain injuries relative to cycle use. 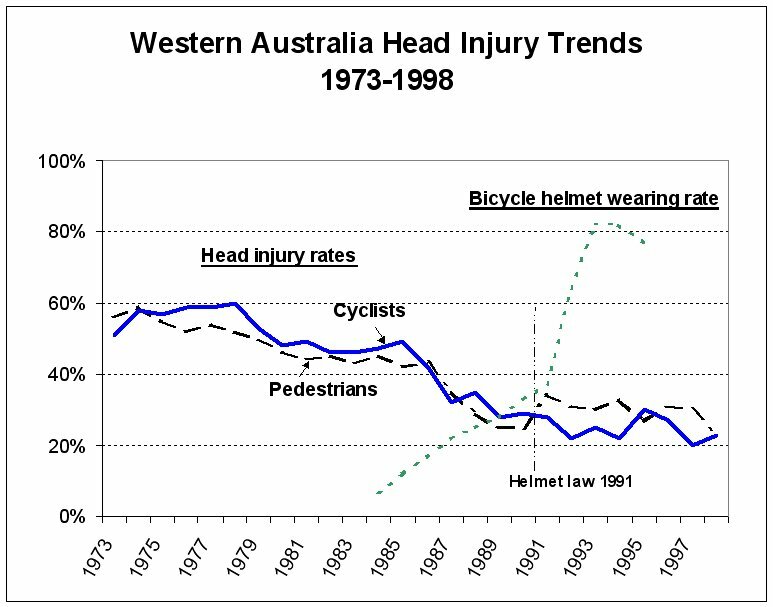 Helmet laws in Australia provided excellent data sets with which to test the effectiveness of cycle helmets because a principal effect of the laws was to increase substantially over a short period of time the proportion of cyclists wearing helmets. This enabled a comparison of a very large number of individuals not wearing and then wearing helmets, eliminating most of the other variables present when comparing different people or dissimilar riding conditions. At first, reports suggested that legislation had achieved its aim of reducing head injuries. But the researchers did not take into account the very large decline in cycle use brought about by the laws. Robinson found that although more than 75% of cyclists wore helmets post-law, this was mainly because of the disappearance of formerly bare-headed cyclists rather than because of an increase in the absolute numbers wearing helmets. The main effect of the law was to discourage cycling rather than to encourage cyclists to wear helmets. Although cycle use fell on average by about 30%, head injuries fell by only 13%, so the risk of head injury per cyclist would appear to have increased. Furthermore, the proportional reduction in head injuries for cyclists was very similar to that for unhelmeted pedestrians over the same period. other road users. All followed similar declining trends, and the data (see graph above) suggests that there was no enduring benefit at all for cyclists. The report concluded that the law had not been cost-effective. New Zealand followed Australia with a mandatory helmet law. This law was also found not to have been cost effective and the head injury rate did not decrease more than for the population at large. In Canada, too, in those provinces where helmet laws have been enforced, no benefit is apparent. In British Columbia and Nova Scotia there was no change in the proportion of cyclists suffering head injuries post-law, although cycle use fell markedly. In Alberta, the helmet law reduced cycling by children by around 56% while the absolute number of injuries went up. Most helmet laws that have been enacted have not been much enforced. This is especially true of child helmet laws in many states of the USA. These laws have less impact on either cycle use or helmet use than enforced laws. There is no credible evidence that they have resulted in a lower risk of head injury. On the other hand, unenforced laws can erode public respect for the rule of law generally, and traffic laws in particular, especially amongst the young people at whom most helmet laws are targeted. There is a stark conflict between the predictions of widely-publicised pro-helmet research, which suggests that helmets can deliver savings in head injuries of 65% to 90%, and data from other sources that suggest no benefit at all at a population level from cycle helmet use. All data sources are subject to error and data collection practices vary widely. But simple data errors are unlikely to account for the large disparities between prediction and the real-world. Many of the studies urging helmet use rely on gross extrapolation. For example, Dorsch's study predicted a 90% reduction in deaths but didn't actually include a single fatality in its dataset and the majority of helmets in her study were the old-fashioned leather hairnet type. In subsequent evidence to a parliamentary committee, Dr Dorsch heavily qualified how the results should be interpreted but citations of her work do not usually mention this. Thompson et al. (1989) studied for the most part minor head injuries in cyclists treated in emergency rooms and used two different methods to estimate the benefits of helmets. There was a 70% reduction in the odds ratio for head injury compared with non-head injured cyclists treated in the same emergency department, and an 88% reduction compared with cyclists in a Healhcare co-operative who simply fell off their bikes. Helmet campaigners invariably focus on the latter estimate although the statistical base is weak. Using the same data, a comparison of helmet wearing rates of the cyclists who fell off their bikes with a control group who did not fall leads to a totally different conclusion: that helmet wearers have the same number of head injuries as non-wearers, but are 7 times more likely to fall off their bikes. Moreover, data presented in that paper, such as the percentages of bicycles damaged beyond repair and the involvement of motor vehicles, make it clear that the head-injured cases had been in much more severe crashes than the two control groups. The comparisons were thus not reliable. To reach their conclusions, helmet campaigners often assume that helmets are equally effective at preventing fatalities and very serious brain injuries as wounds and minor concussions. 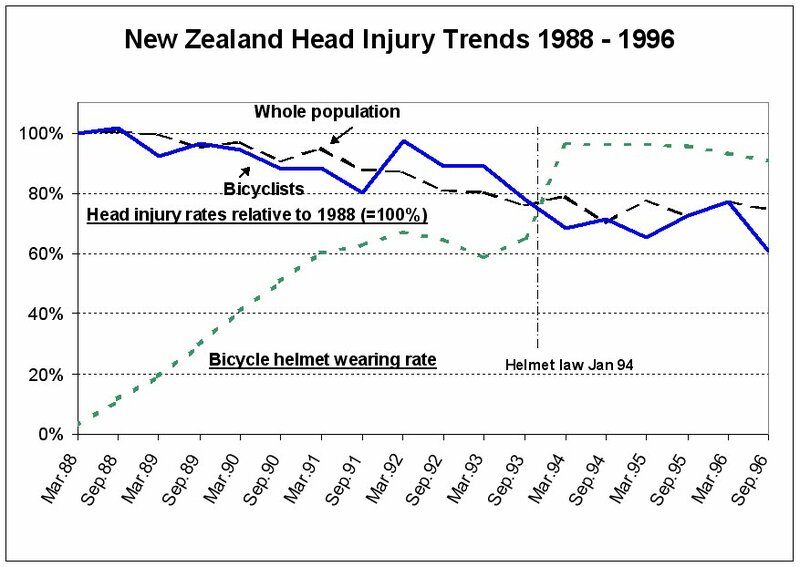 The much more modest results from an Australian hospital admission study (McDermott 1993) that found no significant reduction in head injuries for adult cyclists, are hardly ever mentioned. Most of the frequently cited pro-helmet research has been criticised for fundamental methodological shortcomings, particularly with regard to case-control techniques. Although randomised case studies are a well-regarded research tool, in cycle helmet research randomised studies have not been practical. Non-randomised studies are much less robust and are subject to bias from socio-economic factors not under the control of the researcher. Cyclists choosing to wear helmets are now known to be different from those who choose not to. Voluntary helmet use is most prominent among females, those who have completed more stages of education, middle to upper income groups and people who have not been drinking (see below). Children cycling to school in uniform are much more likely to wear helmets than those not in uniform. This is well established now, but was not known at the time that the early, case-control study research was carried out. Those who choose to wear helmets tend in any case to cycle in ways that make them less at risk of head injury. By contrast, large population time-series surveys derived from multiple sources are subject to fewer biases, and data based on large changes in helmet-wearing behaviour after helmet laws are especially robust. Meta analyses have the potential to minimise bias by basing their analysis over a spread of the scientific research. However, this has not occurred with the analyses on cycle helmets. Two of the three meta analyses are based on the same 16 studies whilst the third analysis is based on a subset of 7 of the same studies. The latter work, published by the normally respected Cochrane Review, is dominated by its authors' own work and no reference is made to critical analysis of this. All three meta analyses are based solely on case-control studies; there is no reference to, or analysis of, studies that found no noticeable change in percentages with head injury for five jurisdictions with hospital admissions data, when helmet wearing increased from a pre-law average of 35% of cyclists to a post-law average of 84%. Elvik (2011), applying robust statistical tests, found evidence of bias in one meta analysis that resulted in the benefits of helmets being greatly overstated. He noted that more recent research shows no net benefit from wearing a helmet. He also finds that the authors of the Cochrane Review had a conflict of interest, which was not declared, and he criticises the narrow selection criteria used for evidence considered by the Review. One research project that aimed to justify a helmet law found that helmet use made no difference to head injury rates. However, a strong link was discovered between head injury rates and the consumption of alcohol or drugs by people cycling. It just so happened that many of these cyclists did not wear helmets. This was an important finding that could easily have been overlooked. It raises the question as to whether other research has confused the effects of alcohol (and other differences in behaviour) and not wearing helmets. Cycle helmet research is not the only area of research where such conflicts exist, as evidenced by an increasing number of papers in epidemiological journals drawing attention to this problem. There have been issues with studies of the effect of hormone replacement therapy on heart disease, vitamin supplements, cannabis and schizophrenia, antibiotics and the MMR triple vaccine. Findings that had appeared robust subsequently turned out to be unreliable or simply wrong. The parallels between these other areas and cycle helmets are considerable, as is the 'snowball effect' that takes place whereby weak research is cross-referenced and becomes the conventional wisdom. A particular problem with helmets is that much of the helmet sceptic data and research come from outside the medical sector and is little known inside it. As well as the poor methodology used in some cycle helmet research, there are also ethical issues of concern. Medical research into helmets has assumed that cycling is comparatively risky; there never was any significant risk assessment completed to justify helmet promotion. This represents a serious failure of due diligence. It is now known that previously sedentary people who start regular cycling may expect to enjoy reductions in mortality rates greater than after giving up cigarette smoking. Since the actual risks of cycling fall in the same range as for walking and driving, helmet promotion directed only at cyclists should be recognised as a serious threat to healthy public perceptions. In addition, it is misleading to publish only a subset of the evidence when the wider evidence might lead to a different conclusion, but this has sometimes been the case. There is a lot of emotional association with helmet research and some researchers may be too committed to a particular outcome to allow them to be as dispassionate as good scientific research requires. One paper that has attracted much criticism purported to show that a helmet law could be introduced without deterring cycle use. The authors failed to mention that the law was never enforced, that there had been a considerable fall in cycling prior to the law when heavy promotion took place and that, although there was no further fall in cycling after the law, there was no increase in helmet use either. Publication bias is a problem that affects all research, whereby papers are only offered for publication and then published if they support the 'right conclusions', whether this be to meet the prejudices of the authors or publishers or established societal norms. Sometimes published helmet research has given more prominence to speculation about helmet benefits than to much stronger evidence that is less supportive of helmet use. There are other forms of bias, too, such as failing to allow for independent trends and missing data. Indeed, helmet research has been bedevilled with confounding influences. Another matter of ethical concern is conflict of interest, that has damaged the reputation of the Cochrane Review. … but, a helmet saved my life! Powerful support for cycle helmets comes from people who believe that a helmet has already saved them – or a relative or friend – from serious injury. This is a very common experience, very much more common than the actual number of life-threatening injuries suffered by bare-headed cyclists. As there is no evidence that helmets save lives or serious injury at all across cyclists as a whole, most of these perceptions of helmet benefit must be exaggerated. People often assume that a helmet has been beneficial because it has broken. However, it is common in these circumstances for the foam liner not to have compressed, indicating that the force towards the head was small. In many of these instances there may have been no impact at all without a helmet. The apparently large proportion of helmeted cyclists who claim that a helmet has 'saved their life' suggests that helmeted riders are disproportionately more likely to suffer head-contact crashes compared with bare-headed riders. This is one of several hypotheses deserving of further investigation. Risk compensation by cyclists (whereby some cyclists take greater risks - often subconsciously - when wearing a helmet) has been confirmed in research and the empirical evidence in its support is becoming stronger. The phenomenon remains controversial in cycling among some safety professionals, although it is now widely accepted in other areas of life. There is also evidence of risk compensation by other road users who sometimes overtake cyclists more closely if they are wearing helmets. A tragic and little known outcome of helmet advocacy is the small number of young children (14 known cases world-wide) who have died through strangulation when playing after leaving their bikes and while still wearing a cycle helmet. This is significant mainly in the context that it is the only unambiguous evidence showing any relationship between fatalities and cycle helmet use, there being no reliable evidence of any lives saved. It is now well established that enforced cycle helmet laws result in much less cycling. In Australia falls in cycle use averaged more than 30% and in Canada 28% to 40%. However, much higher levels of abandoning cycling have been recorded among teenagers, with 90% of teenage girls ceasing to cycle at one Sydney school. These falls in cycle use have not recovered quickly and there has been a long-term change in the profile of cycling. In Western Australia, concerted publicity, population growth and higher fuel prices returned cycling to its pre-law level in absolute numbers after ten years, but there was little recovery amongst children or for utility journeys. Relative to population, cycling levels remain suppressed. Cycling casualties, moreover, are higher than ever before. It has been estimated that cycle use in Sydney would most likely more than double if the state's helmet law was rescinded. Helmet laws have proved a big deterrent to the use of city hire bikes, which have become very popular in non-law jurisdictions. Schemes in Melbourne, Brisbane and Auckland have all failed to attract much use due to the need to wear a helmet and schemes in Mexico City and Tel Aviv were not allowed to go ahead until their laws had been rescinded or reduced in scope. Other helmet law towns are campaigning for law changes before they will invest in bike hire. Cycle helmet promotion, outside the context of helmet laws, has also been shown to be a strong disincentive to cycle use. As well as deterring individuals, it deters institutional support for the promotion of cycling by creating concern about liability if people who are encouraged to cycle do not wear helmets. In European countries, cycling is one of the forms of physical exercise most frequently undertaken by children out of school and any reduction in cycling can impact significantly on children's fitness. In all the countries with enforced helmet laws, there is a high level of childhood obesity. On the other hand, in countries with high levels of cycling and low levels of helmet use, childhood obesity is much less of a problem. It has been shown that the safety of cycling is closely associated with the number of people who cycle. Any decline in cycle use leads to increased risk for those who continue to cycle. The manufacture and sale of cycle helmets is a highly profitable multi-billion dollar international business, dominated by a few large companies. These companies have given money to campaigning organisations that seek to boost helmet use and introduce legislation. The claims made by helmet manufacturers for their products are very modest compared with those made by lobby groups and they do not claim that a helmet will protect from death. However, the industry has been active in promulgating the results of pro-helmet research by others, even where this predicts benefits from helmet use well in excess of what manufacturers feel able to justify. In many countries, industry campaigns to boost helmet sales in countries where helmet use is low have been driven by purely commercial considerations. Is head injury a problem when cycling? One outcome of the emphasis in recent years on cycle helmets and head injuries has been to brand cycling as an inherently hazardous activity, with a particularly high risk of head injury. In fact, this is untrue. Everyday cycling, like walking, is a low-risk activity, and one where the health benefits outweigh the risk of injury by 20:1 or more. The bottom line is that people who cycle regularly live longer, on average, than people who do not, with healthier lives and less illness. This cannot possibly mean that cyclists are especially vulnerable to life-threatening head injury. In England the number of children each year who experience serious head injury when cycling is no more than about 500 – out of a population of 6 million children who cycle frequently. Few of these injuries are life-threatening. The risk of head injury is little more than the average of all childrens' activities and comparable with travelling as a pedestrian. Good evidence of the safety of cycling comes from city bike hire schemes worldwide. Up to 2011, the popular schemes in London and Dublin had generated over 8 million cycle journeys with no serious casualties of any kind. This is a very low level of risk and few riders wear helmets. The health benefits of cycling are substantial. Indeed, cycling regularly is the single most effective thing that a person can do to improve their health and increase longevity. Conversely, however, cycling less – perhaps as a result of being deterred by helmet laws or the exaggerated perceptions of risk generated to promote helmet wearing – results in considerable health loss to both individuals and society. Obesity is a major health problem in western countries, particularly those with helmet laws. Very few people who cycle regularly become obese. Using a model to balance the claimed safety benefits through helmet laws against the health costs of decreased cycling, the University of Sydney has suggested that there would be a net disbenefit of USD 5 billion for a USA-wide law, USD 0.4 billion for the UK and USD 1.9 billion for the Netherlands. One of the most common forms of brain injury is as a result of strokes, the risk of which is much reduced through cycling. It would take only a small number of people to be deterred from cycling by helmet promotion or laws for there to be a net increase in brain injuries. The World Health Organisation has developed a Health Economic Assessment Tool to estimate the economic savings resulting from reductions in mortality as a consequence of regular cycling and/or walking. Applying the tool to UK data suggests that a hypothetical helmet law would cost society between GBP 304 and GBP 415 annually and lead to an additional 253 premature deaths per year. According to public health professionals in the UK, the better health from regular cycling is such a powerful benefit that arguments over risk and helmets are simply wasted time. Safe though cycling is, the best proven way to improve the safety of cycling further is through the encouragement of more people to cycle. Cycle helmet promotion and laws, on the other hand, discourage cycle use and thereby lead to worse health and safety. Analysis by de Jong in 2012 has shifted the focus of the helmet debate away from the effectiveness or otherwise of helmets onto the arguments about the degree to which the large health benefits of cycling outweigh the far smaller risks involved. de Jong uses mathematical modelling to show that even under the most optimistic predictions of helmet benefit, the net public health outcome of helmet promotion (let alone laws) is negative. This is because the risks in cycling are so small and the health benefits so great, that no reduction in cycle use would be acceptable in public health terms. How common is head injury when cycling?